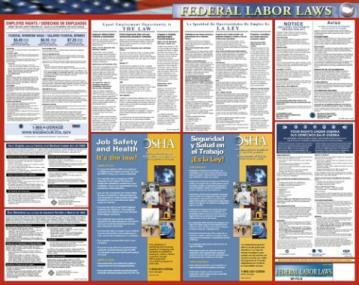 Our new Bilingual version of the Federal Only poster allows you to save wall space while posting the federal notices for both your English and Spanish speaking employees. Designed to be used with State only posters in states where Spanish is required to be posted or for any employers who have Spanish speaking employees. Simply post this and the English and/or Spanish state posters and you'll be in complete posting compliance.